I admit to having a slight obsession with butternut squash. I love the flavor. I love its versatility. I love the color orange. On the cooking show I work on we have used butternut squash in a couple healthy mac n' cheese recipes. The first season, one of our chefs made baked butternut squash mac n' cheese. 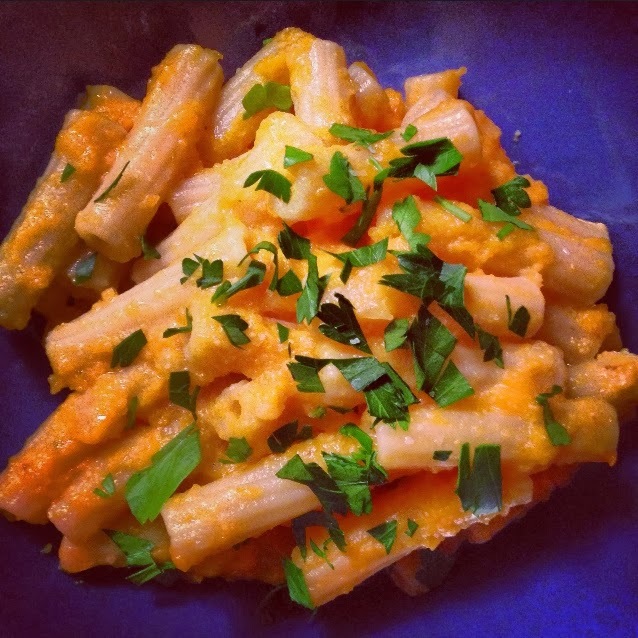 This season, Chef Vikki made a stove top butternut squash mac n' cheese. I've seen a number of butternut squash lasagna recipes, and I even read about a squash carbonara. Having tested, tasted, and loved the recipes for the show, it felt like it was time to take a stab at my own version of some kind of butternut squash pasta sauce. For almost every squash recipe I make, especially soup, I prefer to roast my squash as opposed to cooking it in a liquid on the stove. The squash gets caramelized, which adds to the depth of flavor. I find simmered or steamed squash slightly bland. This recipe shouldn't be followed exactly. You'll need to taste the ingredients and add more of whatever you think it needs or doesn't need. The basic idea is: roast squash, sweat onions and garlic, add roasted squash to the pan, add fresh thyme salt and pepper, add some water (or stock), add some milk, let it simmer and cook through, boil some pasta while that's happening, puree the sauce, add some cheese, top with fresh herbs, and serve. Line a sheet pan with parchment or foil (easier clean-up). Cut your squash in half, lengthwise. Scoop out the seeds. Drizzle olive oil over the squash. Place flesh side down, and roast in the oven for 35-45 minutes, or until the squashed is cooked through (it should be soft when you pierce it with a fork or knife. Once the squash is cooked, let it cool slightly. Bring a large pot of boiling water to a boil. In a deep sauce pan or pot, over medium high heat, heat a few tablespoons of olive oil. Add the diced onion to the olive oil and let the onion sweat until soft and translucent, about 7-8 minutes. Add the minced garlic and thyme leaves to the onion and let it cook for another minute or two. Scoop the cooked squash out of its skin, and add it to the pan. Add the water and milk to the squash mixture. Bring the mixture up to a simmer, and then turn down the heat to low. Let the butternut squash sauce simmer while you prepare your pasta. Add your pasta to the boiling water, and cook until just al dente the box will indicate the correct amount of time for an al dente noodle, but keep your eye on those guys and make sure they don't get mushy because that's the worst. Once the pasta is cooked and drained, add it back to the warm pot. This will allow any excess water to evaporate. Using an immersion blender or a regular blender, food processor, or potato masher, puree your squash mixture until it is smooth and sauce-like. It doesn't have to be perfect, in fact, just roasting the squash will make it break apart easily when added to the liquid. Turn the heat off. Add the shredded cheese and stir until it is melted into the sauce. I like to go light on the cheese. If you want to mimic mac n' cheese, add more of the cheese. You can also adjust the thickness of the sauce by adding more milk or half and half if you're feeling decadent. This sauce is all about what you like. Season with salt and pepper. Add the finished sauce to your pasta leftover sauce can be frozen. Garnish with freshly chopped parsley. Serve with grated parmesan and red pepper flake.